The Texas House on Wednesday gave final sign-off to a far-reaching ethics reform package that would shine light on so-called “dark money” while restricting undercover recordings of people in the state Capitol. State Sen. Van Taylor, a Plano Republican who has carried ethics reform in his chamber, quickly issued a statement on Tuesday night expressing "astonishment for the elimination of meaningful ethics reform" in the House version of the bill. "Some in the House apparently don’t think elected officials are the problem and instead muddled the bill with a litany of bizarre measures that point the finger at everyone besides themselves, including a page from Hillary Clinton's playbook to launch an assault on the First Amendment," Taylor's statement said. "This is one of those head shaking moments that rightfully raise doubts in the minds of our constituents as to the Legislature's resolve to serve the people above all else." 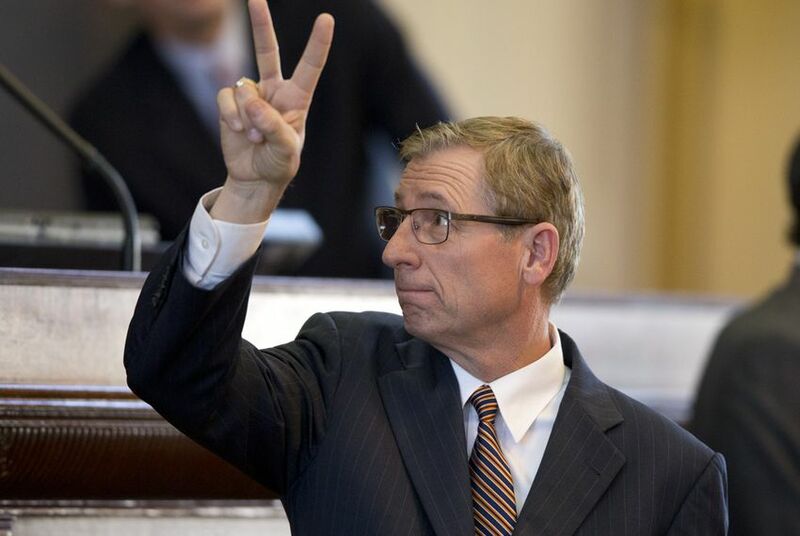 The bill author, Rep. Byron Cook, R-Corsicana, said dark money has had a corrupting influence on politics in the United States and warned that without reforms those abuses will eventually visit Texas. In the 2012 election cycle, politically active non-profits spent more than $300 million in dark money to influence elections, according to the Center for Responsive Politics. A dark money scandal in Utah also brought down that state's attorney general. Quoting from a message to Congress from President Ronald Reagan, delivered in 1988, Cook said the right to free speech depends upon a "requirement of full disclosure of all campaign contributions, including in-kind contributions, and expenditures on behalf of any electoral activities." While divisions over dark money could threaten the bill in these final days of the session, the language dealing with secret recordings sparked the most heated debate — and demonstrated the degree to which legislators have been rattled by activists who have been following them around and, according to published reports, secretly capturing their movements and conversations. Cook didn’t name the American Phoenix Foundation, but it was clear the bill sponsor was referring to the group, which is supported in part by donations from conservative businessmen. Before its final vote, the House added an amendment from state Rep. Morgan Meyer, R-Dallas, that describes the conditions under which someone can record conversations in the state Capitol. Under the amendment, those who fail to disclose or falsely disclose that they are recording a conversation would be opening themselves to civil lawsuits. The measure "allows for anyone in the Capitol to record as if they were anywhere else in the state of Texas," Meyer said. "The only difference is that that person being recorded can ask the person if they are recorded." If the person recording fails to answer, they can face a civil penalty and be sued. Ethics reform was deemed an emergency item by Abbott at the start of the session, which helped trigger an avalanche of proposals designed to curb legislative conflicts of interest, enhance disclosure of lawmakers’ sources of income and rein in the power of special interest lobbyists. The bill would prohibit elected officials who become lobbyists from making donations out of their old campaign accounts for two years after they leave office and start lobbying; the provision replaces a “revolving door” provision that would have prohibited members from immediately becoming lobbyists when their public service ends. The bill would lower the amount lobbyists can spend to wine and dine state officials without disclosing the names of the politicians. But the House turned down an amendment by Rep. Eddie Rodriguez, D-Austin, to close a loophole that allows lobbyists to easily evade that disclosure by teaming up with other lobbyists to spend far more than the current $114 — lowered to $50 in the House bill unless the Ethics Commission wants to raise it back to $114. Influential conservative groups, including Empower Texans and the anti-abortion group Texas Right to Life, have expressed vociferous opposition to the dark money provision, saying it would chill free speech. A similar proposal was vetoed in 2013 by then-Gov. Rick Perry. And Taylor in the Senate has harshly criticized inclusion of it in the reform effort. Taylor's statement said he hopes to find common ground with the House, but will not accept any effort to "weaken the First Amendment, chill free speech, or restrict the ability of individuals to engage in the political or legislative process." “Intimidating supporters and citizens with superfluous disclosure laws does not prevent corruption but instead allows those in power to silence citizens in public debate on issues of legislation and election,” the group said. But Craig McDonald, director of the liberal group Texans for Public Justice, said dark money disclosure is long overdue. He criticized the provision dealing with secret recordings but said the bill offers serious ethics reform. Abbott, who has taken a dim view of restrictions on dark money, did not immediately weigh in on the House’s action. He applauded the Senate after the upper chamber passed its version, which included a controversial provision that would have required all candidates for elective office to undergo drug testing. That idea got stripped out, but a brief debate over putting it back in touched off a humorous but often raunchy debate Tuesday night. Rep. Roland Gutierrez, D-San Antonio, objected to the proposal, because he said it “demeans us as public servants” — but most definitely not because he’s worried about what a drug screen would show. “I’m willing to go take a piss test right now,” he said. He also wondered out loud if lawmakers would be monitored during drug tests. “Who gets to watch me urinate?” he asked.